Single deck steel pallet can be used only on one side and it has two / four side entry for the forklift and stackers. 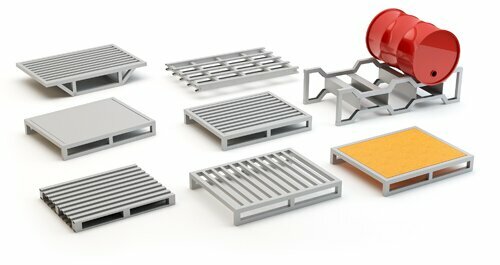 Steel pallets having two way entry type pallets are preferred for use in heavy duty racking system. Any practical size of steel pallet can be made as per customer requirement. Load bearing capacity from upto 3000kg UDL. Drum pallets are designed to store single or two drums. It can be stacked one upon another at 4 high. For moving and handling loaded steel drums this is the quickest, safest & easiest method to move individually or by the stack with a forklift truck. Drum Pallets are accessible on all the four sides with MS pressed channels cradles. Steel pallets are more durable and stronger than wood or plastic pallets. Do not splinter like wood pallets.